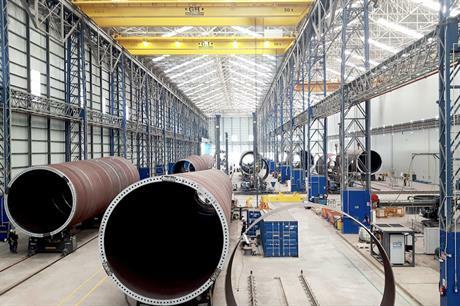 SPAIN: Tower manufacturer GRI Renewable Industries has opened a new €40 million factory in the port of Seville, as it moves into production of offshore towers. It is also looking for a business partner to provide "production machinery" for its factory in the southwestern Spanish city. The factory took seven months to build and uses machinery provided by Finnish global welding and production automation provider Pemamek. It has seven extra heavy duty column and booms, a double head-welding platform, 32 roller beds ten metres in diameter and capable of supporting 350 tonnes, four assembly lines, a plate-joining station and milling machines for longitudinal and circular joints. Up to 400 members of staff will be employed at the factory, GRI stated. Juan Jose Porras Borrego, general manager of GRI’s Seville plant, said: "Production is going well with low welding rejection rates and with a spectacular learning curve in terms of processing hours, which is great for a start-up factory." To date, GRI has only built towers for onshore turbines at its factories in Spain, Turkey, India, the US, China and South Africa.